Every year in the United States, 2 million bone breaks occur due to osteoporosis. 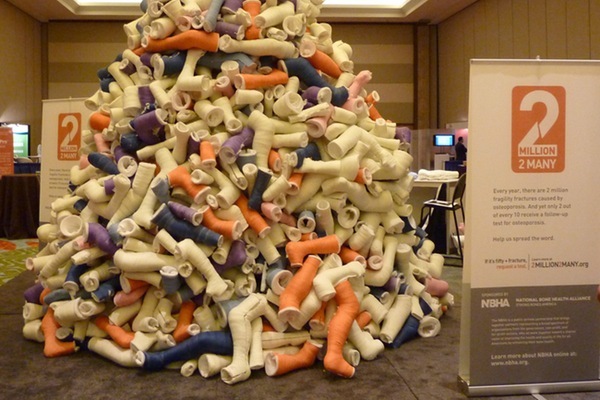 Our cast mountain symbolizes the number of fractures every day happening in adults over age 50: an astonishing 5500. Don’t let this disease shatter more lives. If you or someone you care about breaks a bone after age 50, ask your healthcare professional for an osteoporosis test. Help us get the word out and add your name to the rallying cry that 2 Million is 2 Many. Most people who break a bone are treated in the emergency room or at an urgent care facility. And life goes on. But the fact is, men and women as young as 50 may have osteoporosis and not even know it. Yet only 2 in 10 older women who break a bone due to osteoporosis are treated or receive a simple test for osteoporosis. World Osteoporosis Day is October 20th each year. The International Osteoporosis Foundation initiates a new theme for a global campaign on the fight against osteoporosis. The 2012-2013 campaign focuses on identifying individuals who have broken a bone. Since one fracture leads to another, you need to STOP AT ONE. Get appropriate care to reduce the risk of future fractures.